By adopting the right mix of laws and rules and creating the appropriate institutions and structure that establish clear guidance on cybersecurity, governments can create a sound foundation for taking full advantage of the opportunities of the digital economy and an environment of cooperation with relevant stakeholders. These steps will help all parties involved, from national governments to private-sector actors, in the joint effort that is needed to protect systems and prevent, mitigate and respond to cyber-attacks. 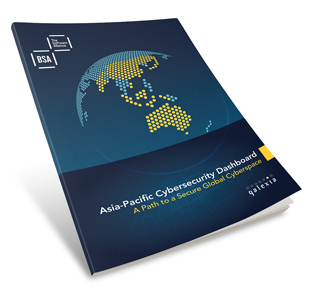 This Dashboard focuses on the policies of the markets studied, but the questions that compose the Dashboard also provide a baseline standard by which any country in the region, or around the world, can measure their progress toward a mature cybersecurity policy environment. This study of cybersecurity is based on an assessment of 31 criteria across six themes. Each criteria is given a “Yes,” “No,” “Partial,” or “Not Applicable” status. There are no overall rankings or scores in this study. This analysis is the result of desk-based research on publicly available information, and did not involve direct interviews with national agencies. Where possible, the research study and summary materials include links to further information and resources. The research period concluded on 1 January 2015 and general information in the study is correct up to that date. The currency of specific data on ICT infrastructure is noted separately in the study. BSA | The Software Alliance (www.bsa.org) is the leading advocate for the global software industry before governments and in the international marketplace. Its members are among the world's most innovative companies, creating software solutions that spark the economy and improve modern life. With headquarters in Washington, DC, and operations in more than 60 countries around the world, BSA pioneers compliance programs that promote legal software use and advocates for public policies that foster technology innovation and drive growth in the digital economy.